A guide to the best Easter treats – you may be surprised! Struggling to get on track this January? The keto diet has become very popular on social media but can be very confusing for people… it’s often called the high protein diet or LCHF (low carb high fat) diet, which goes against our best instinct for weight loss; after all, fats are the highest calorie food so why would you eat lots of them? 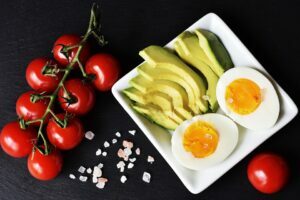 My aim in this post is to explain the ketogenic diet and how it works – here goes… if you have questions feel free to get in touch! What is the keto diet and who is it best for? The keto (ketogenic) diet is a very low carbohydrate eating plan that promotes fat burning and can help you lose weight more efficiently. I recommend it for people who have a lot of weight to lose or want an effective ‘kick start’ to their longer-term weight loss plan. I also highly recommend it for type-2 diabetics (with professional advice) or pre-diabetics. Who is it safe for? It’s safe for most people BUT if you’re on medication you should check with your GP before going on a ketogenic diet. If you do a lot of exercise (more than 30 minutes per day of moderately intense exercise) I wouldn’t recommend a strict keto diet as it can leave you short of energy and / or dizzy during or after intense exercise and you won’t be able to perform at your best when exercising without the 2 normal sources of fuel: carbs and fat. Why is a keto diet effective? 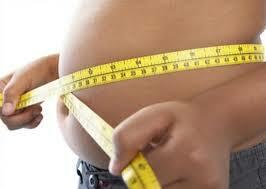 If you reduce carbs, your body will use up a short-term carb store called glycogen. Glycogen is about three-quarters water (the famous ‘fluid loss’ you get at the start of a diet) and once your glycogen store is used up and you’re not eating carbs to replace it, your body will make ‘ketone bodies’ from stored fat – an alternative source of fuel for the body (particularly for the brain, which usually runs on glucose). This is like a fast-track to using up stored fat as energy. Why are fat and protein important in the keto diet? Your body needs fat for insulation, brain function, production of hormones and for countless other processes in the body. You need protein for growth, repair and maintenance of every cell in the body. The benefits of fat and protein for weight loss are that they both keep you feeling more satisfied and fuller for longer compared to carbohydrates which are much more quickly digested. What about fruit and vegetables? 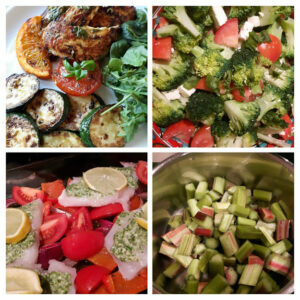 Be sure you have enough low carb veg to keep you (and your bowel!) satisfied. More importantly, filling up with more veg than starchy carbs is the key to keeping the weight off, even when you’re back on moderate amounts of carbs. Fruits are a valuable food group but can give the body the message that sugar is available again and so switch off ketosis, making you feel hungrier, so fruits should be avoided at least at the start of a keto diet; after a while you can introduce small amounts of low sugar fruits like raspberries. Rhubarb is really a vegetable and can be used (it’s tasty with sugar-free jelly) as a guilt-free treat on the keto diet. Do you need special protein shakes or bars on the keto diet? No! 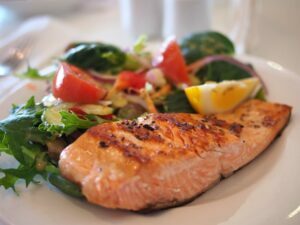 You can do the keto diet with ordinary food – proteins, good fats and low carb vegetables. How much weight will I lose on the keto diet? It depends on your body size, age, gender and body composition – I have known many clients to lose 2 stone or more in 2 months on this plan. The initial boost is a great motivator to continue and achieve a healthy weight, even if weight loss does slow down (which it will) after the initial strict phase.